Brace yourselves, it's here. The fans will love it, the band's popularity will grow even more, and EMI can rest easy. When a young band is on the verge of huge worldwide success, and have to deal with the pressure of writing and recording a follow-up to their breakthrough second album, the last thing they want to hear is how their record label is depending solely on that band to rescue them financial ruin. You can't blame EMI for being just a bit nervous about the new Coldplay album, especially considering their profits plummeted 13 percent in 2004. In an effort to squeeze every last cent out of the consumer, the publicity machine surrounding the new Coldplay record has been in full spin mode, with magazine fluff pieces ostentatiously declaring that Coldplay are about to supplant U2 at the Biggest Rock Band on Earth. No question, Coldplay want to be the biggest band in the world (as does every other band on the planet), but the more the advance hype builds, the more spectacular their fall will be if the album fails to meet expectations. Who are we kidding, though? We all know X & Y will be massive, but not because the London foursome are sonic innovators, and not because they have anything profound to say. They're simply a good little band who know how to sound big and push listeners' buttons, both on record and in concert: understated gems like "Yellow" and "Everything's Not Lost" made the masses swoon, "Politik" bled with tastefully tepid passion, and the massive single "Clocks" has become one of the more sublime radio staples of the past five years. Live, the band excels at the slow crescendo, the overtly sincere Chris Martin the focal point, as his bandmates, versatile guitarist Jon Buckland, quiet bassist Guy Berryman, and steady, often powerful drummer Will Champion act as the real driving force behind the music, ebbing and flowing between textured ballads and soaring codas. In other words, music perfectly tailored for stadiums. Coldplay have always been formulaic, but what makes so many people like them (and so many others annoyed by them) is that they work that formula better than anyone. True to Coldplay's nature, their crucial third album, their bid to become huge stars, couldn't be more controlled and unassuming. X & Y does adhere to the sound that made A Rush of Blood to the Head a 10 million seller, but at the same time, Mr. Martin and company continue to tentatively stretch out their sound, and the way they subtly incorporate sounds that we would otherwise not hear from a popular mainstream pop act is the album's most shrewd quality. Opening track "Square One" begins with layered, ambient synths, obviously inspired by Brian Eno's 1970s compositions, followed by a gentle dance beat provided by Champion, but before long, the song bursts into a pensive, effective Echo & the Bunnymen homage (not the first time Coldplay has turned to the music of Ian McCulloch), Buckland's guitar accents dominating, underscored by Berryman's lithe bass melody. The terrific "White Shadows" and the aptly titled "Low" both draw slightly from Berlin-era David Bowie (as well as New Order), as the band brings the tracks to swirling conclusions, while textured, keyboard-laden tones highlight the downbeat "Twisted Logic". It's the excellent, and much talked-about "Talk" that has the band showing tremendous creativity, delving straight into mid-'70s krautrock, and piecing together a gorgeous pop song. Built around a simple guitar lick by Buckland, copped directly from the memorable synth hook from Kraftwerk's 1981 single "Computer Love" (to the point where Kraftwerk shares songwriting credit), the song cruises at a hypnotic pace, Champion mimicking the insistent, metronomic beats of the first Neu! album. At his best, Buckland is the band's greatest asset, which he proves on this particular track, as he shifts immediately from chiming notes to more abrasive, muscular riffs during the breakdown near the end of the song. For every moment of adventurousness, however, there's a dose of the Same Old Stuff. It's clear Coldplay are in "If It Ain't Broke Don't Fix It" mode, as X & Y has its share of conventional crowd pleasers that the majority of their audience seems to like. While these songs stick rigidly to the template set by the previous album, they nonetheless serve their purpose well. "Fix You" is the best ballad of the lot, continuing where "The Scientist" left off, climaxing in the grandiose, emotional bursts that this band has mastered, Buckland doing his best Edge imitation, which, shameless as it may be, still trumps anything U2 did on Vertigo. The gentle, tastefully done "Swallowed in the Sea" hearkens back to their Parachutes album, sounding melancholy without becoming maudlin, while "The Hardest Part" is a pleasant slice of R.E.M. style pop. "What If", "A Message", and "Speed of Sound" come close to sounding too safe, almost like the band is on autopilot, but it's the acoustic "Til Kingdom Come" that sounds unnecessarily tacked on, a song better suited to B-side status. If there's one complaint Coldplay's detractors will have, it's the questionable quality of Martin's lyrics. Granted, the guy has never been the strongest wordsmith, but he hits a new low on X & Y, starting on "Square One", where he has the gall to ask the world, "Is there anybody out there who/ Is lost and hurt and lonely too?" His attempts at philosophical poetry are tough to bear at times; "Do you feel like a puzzle, you can't find your missing piece?" he muses at one point, and a few songs later, he continues clumsily, "Some things you have to believe/ When others are puzzles, puzzling me." You can't blame Martin for feeling good about himself (if you were happily married to Gwyneth Paltrow, wouldn't you? ), but on "A Message", his love song lyrics turn from treacly to gruesome: "My song is love/ Love to the love that's shown... I'm on fire for you, clearly." On "Swallowed in the Sea", he declares, "I could write a song/ A hundred miles long." Let's hope it never comes to that. Innovation is not Coldplay's strong suit, but charm is. Although Martin's lyrics are dicey, he sells them with conviction. Buckland might be channeling The Edge and Echo & the Bunnymen's Will Sergeant a few too many times, but it's impossible to deny that he's good at it. And the hour-long album does sound a touch bloated after 45 minutes, as the band opts for a few too many ballads when they're much better playing more upbeat material, but although they tread carefully on the record, there's rarely a mis-step. 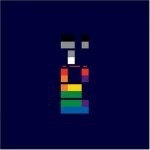 While Coldplay does show growth on X & Y, those who expected an album that takes big risks are listening to the wrong band. Amidst all the pressure and expectation, Coldplay have kept a remarkably even keel, releasing yet another album of affable, accessible, introspective guitar rock, with enough inventiveness to avoid sounding overly repetitive. The fans will love it, the band's popularity will grow even more, and EMI can rest easy.